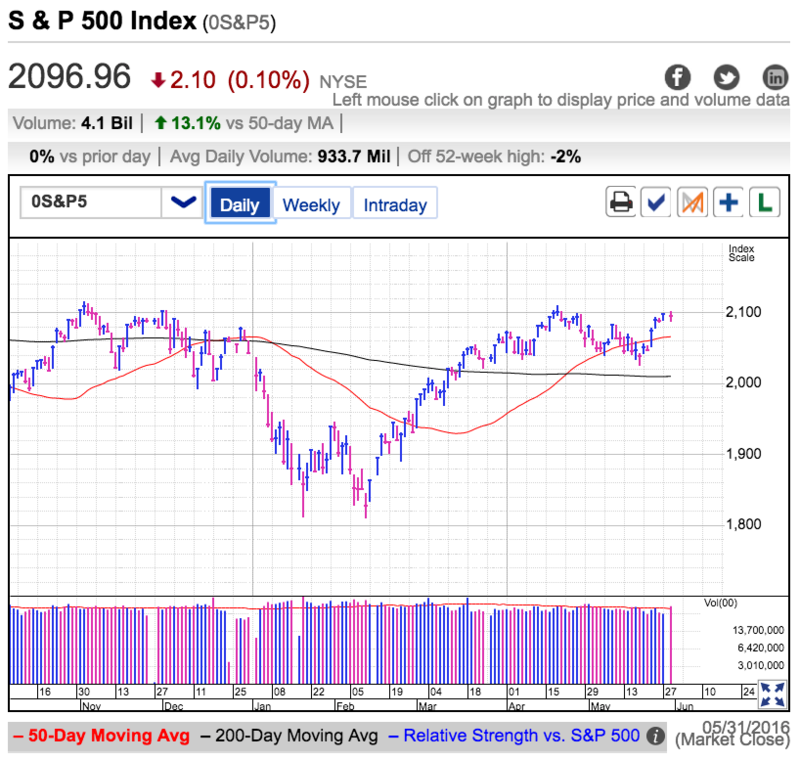 The S&P 500 gapped above 2,100 resistance at Tuesday’s open, but the euphoria was short-lived and we slipped back under this psychologically important level by midmorning. That tells us few were willing to chase the breakout and we were held back by a lack of demand. Volume was elevated, but this had more to do with last day of the month adjustments than the crowd overreacting to today’s price-action. The big weekly event is payroll numbers on Friday. Another lukewarm or better result will give the Fed a green light to raise rates over the next few weeks. In her speech on Friday, Janet Yellen made it clear a June or July rate-hike is still a very real possibility. Following some brief intraday volatility, the market largely brushed off the rate-hike talk and ended the day strong. This was bullish because it showed most owners don’t fear a quarter-point rate-hike and were more than content hold their stocks through this noise. But this morning’s fizzled breakout tells a different story. 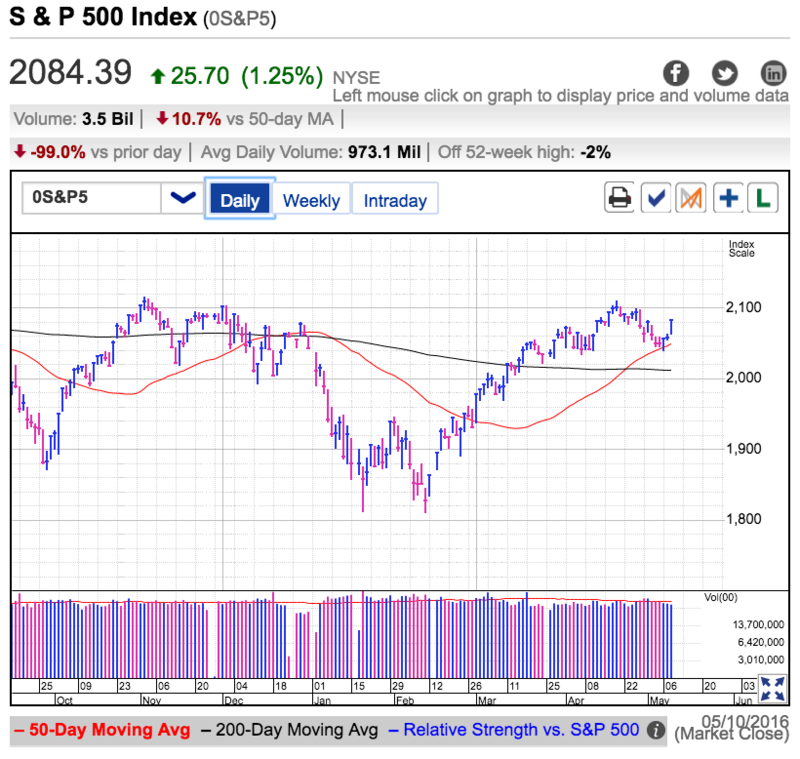 While lack of supply fueled this two-week rebound from May’s lows, we are running into an equal and opposite lack of demand as we approach old highs. Since we are quickly rolling into the summer doldrums, we are more likely to fall into a trading range than breakout to new highs. Big institutional decision makers are headed to the Hamptons and they are leaving their portfolios on autopilot. We need traders to buy this market with enthusiasm to breakthrough a stubborn 2,100 resistance level. At the moment stalling seems more likely than chasing. Until we get better clarity about the market’s intentions, short-term traders are better off waiting for a more attractive opportunity than trying to force a bullish or bearish bet here. If we roll over, expect the profit-taking to push us back to the 50dma. On the other hand, if we keep bumping up against 2,100 resistance, there isn’t much selling pressure and we will likely continue to all-time highs. Both of these moves only amount to a couple dozen points, so don’t expect an explosive move in either direction. But during the summer we take what we can get. Thursday was a quiet day for the S&P 500 as we await Janet Yellen’s speech on Friday. Volume was exceptionally light because few chose to adjust their portfolio. This apathy showed up in the price-action too as we spent all day inside a few point range and closed exactly where we started. Given the 65-point rebound off last week’s lows, a do-nothing day is constructive. It allows traders to catch their breath and suggests that we are not at unsustainably overbought levels yet. If demand dried up and nervous traders were taking profits, we would have quickly tumbled from these levels. That means at least for the moment owners are confidently waiting for higher prices. When owners don’t sell, supply stays tight and prices remain strong. The wildcard is what Janet Yellen says on Friday. Rate-hike headlines fell off of the front pages and that dissipating fear allowed us to rebound from last week’s lows. But has this move already priced in bullish comments from Yellen? Since risk is a function of height, the surge in prices makes this a riskier time to buy than last week and there is less margin for error. If she says the right things we bounce a little higher. If she says the wrong things, there is 50-points of air underneath us. Limited upside and lots of downside setup a poor risk/reward for buying the market ahead of this speech. The most likely outcome is Yellen keeps a June rate-hike on the table and the stock market switches into fretting mode. That could push us back down to the 50dma. But since these comments won’t surprise many, only the knee-jerk traders will sell the news. Once they are out, supply will dry up and prices will bounce. Buying this rebound will be a good entry for those that missed last week’s recovery. But after a brief period of volatility, expect the frenetic trading to dry up as we return to more benign summer trade. Since a big portion of the institutional decision makers are on their way out the door for summer vacation, expect most portfolios to be put on autopilot. That means no big directional moves and a summer trading range to develop. Buy the dips, sell the rips, and repeat until fall. Stocks exploded higher in one of the biggest up-days of the year. We received encouraging housing numbers this morning but they were certainly not enough to justify this type of pop. Instead of a fundamental driver, this rally was fueled by sentiment. 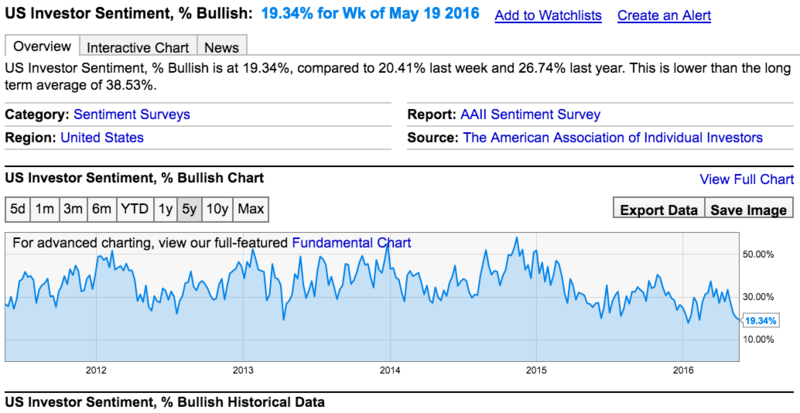 As I wrote last week, bullish sentiment fell to five-year lows. While things can always get worse, the more skewed the market gets in one direction, the more likely a swift reversal becomes. Last Thursday’s intraday dip and rebound was our signal to buy. Breaking support is an obvious trigger for additional selling, but when that wave of liquidation failed to materialize, that is when we knew the sellers weren’t there. Friday’s and Tuesday’s strong gains confirmed this thesis. We’re not going up on good news, we’re rallying on a lack of supply. No matter what the headlines, when owners don’t sell, supply tightens and prices rebound. The cynical bear will point to Tuesday’s light volume rebound, but that is further proof most owners are not interested in selling. They’re happy with their positions and not responding to headline fear-mongering or weak price-action. Tuesday’s rebound reaffirms their decision to hold, making them even less likely to sell the next round of recycled rate-hike/China/oil/weak earnings headlines. Given how skewed sentiment was, most likely there is more life in this rebound. The next obvious target is 2,100 resistance. From there it really becomes a battle of wills between those with cash and those with stock. Every previous rally attempt was thwarted when those with cash were unwilling to chase a breakout. Since we are quickly approaching the summer doldrums, we shouldn’t expect anything different this time. With big money managers headed to the Hamptons, a lot of institutional money will be on autopilot over the next few months. That means a continuation of this this sideways chop. Until further notice, buy weakness and sell strength. For a trading plan, as long as the market continues to behave well, dip-buyers should hold until we test 2,100 resistance. Breaking this level could lead to another round of chasing and short-covering. If the breakout fizzles, that will be our signal to take profits. On the downside, take profits defensively if we stumble back under the 50dma this week. A deflation similar to May 11th tells us there is no demand and we need to lock-in profits before they evaporate. The S&P 500 fell out of bed Thursday morning when the Philly Manufacturing Index came in below expectations. This conspired with Wednesday’s rate-hike fears and we crashed through 2,040 support. But just when it looked like we were falling into the abyss, we ran out of sellers and rebounded into the close, erasing a big chunk of the morning’s losses. It was a scary morning for the traders who reactively dumped their stocks before “things get worse”. But for the contrarians in who moved to cash last week, this price-action is exactly what we have been waiting for. As I wrote last week, I was excited about March 10th’s 1.25% pop. That is until the rebound stalled the following day. That’s when I told my subscribers I was taking profits and moving to cash. A sustainable rebound would keep going. When last week’s rebound fizzled, that was our signal to move to the sidelines. But rather than give up on the trade, I knew I was simply early. Breaking support this morning and then rebounding is the sign I was looking for to jump back in. Even though the headlines and price-action feel scary, these are nothing more than recycled news stories. We’ve been talking about rate-hikes, Chinese slowing, oil weakness, a sluggish recovery, and strong dollar for six-months. Traders that fear these stories sold a long time ago and were replaced by buyers who are comfortable holding these risks. This churn in ownership is how news gets priced in. When there is no one left to sell a headline, it stops mattering. While an inflammation here and there can cause some indigestion, the size of each successive dip gets smaller and smaller. Without anything new to add to the same old story, we can be comfortable knowing dip won’t go much further. 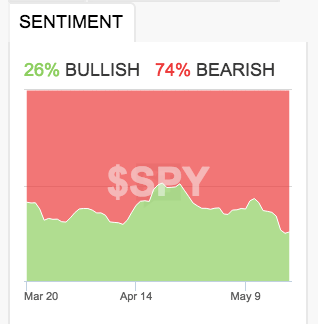 And if we need confirmation, 74% of StockTwits users on the $SPY stream are bearish and AAII bullish sentiment is at 5-year lows. Pretty surprising how bearish the crowd can be when we are less than 5% from all-time highs. Is it reasonable to expect a big chunk of the market to see the next big crash coming from a mile away, or is it more likely that the crowd is getting this one wrong and selling just before we rebound? It’s pretty obvious which side I’m on, but only time will tell for sure. Thursday’s rebound created an attractive entry point but just like last week, if this bounce fizzles, then we’re still too early and need to move back to the sidelines. If this is the real deal we should rebound decisively Friday. We don’t need positive news story, simply an exhaustion of the selling. People trade their outlook and with so many bears running around we have to be darn close to running out of sellers. No matter what the headlines are, when we run out of sellers we stop going down. The S&P 500 popped 1.25% in one of the biggest up-days of 2016. There wasn’t a headline worthy of this price-action, instead these gains were driven more by a lack of bad news than anything else. Overnight Chinese markets ended flat, Japan was up, and oil stopped selling off. What was holding us down the couple of weeks let go and the market responded by taking flight. Bears should take note: when we the market refuses to sell off on bad news, that tells us it is poised to go higher once the negative pressure lets up. That is exactly what happened Tuesday. There are two types of pullbacks, routine and emotional. Routine pullbacks are part of the natural ebb and flow of supply and demand. Two-steps forward, one-step back. These are measured and controlled. On the other side, emotional crashes occur when fear spreads like wildfire through the market and trades “sell first and ask questions later”. This distinction is important to us is because it lets us anticipate how deep a pullback will be. Routine dips bounce sooner than most expect while emotion fueled selloffs go far further than people are prepared for. In broad terms, routine dips bounce above support and emotional moves smash through support before bouncing. Tactically speaking, we buy routine pullbacks early while emotional selloffs require more patience before jumping in. Since this dip was fueled by recycled headlines, it had less potential to dive to new lows and is why it made sense to buy the dip early. Just like in nature, symmetry is an important part of the markets. Less potential on the downside also means less opportunity on the upside. Routine rebounds are far more modest than their emotional counterparts. That means while Tuesday’s gains are nice, we should be thinking about taking profits sooner than later. We will be able to measure this rebound in the 10s of points instead of the multiple 100s that followed February’s highly emotional lows. 2,100 is the obvious target as long as China and Oil remain subdued. Given that we didn’t fall very far, there is less upside driven by chasing and squeezing. But what this rebound does create is even more confident owners who are that much less likely to sell the next round of negative headlines. If we can break through 2,100 and hold above this level, that sets the stage for an assault on all-time highs above 2,130. Hold those highs and it could be a nice summer to own stocks. On the flip side, if we quickly unwind Tuesday’s gains over the next couple of days, this was a bull-trap and we are headed for a retest of 2,000 support. Trade accordingly. The S&P500 treaded water Thursday ahead of Friday’s monthly employment report. We opened higher, but that attempted rally fizzled and we stumbled into the red by lunchtime. But the selling was just as uninspired and we rebounded back to breakeven by the close. 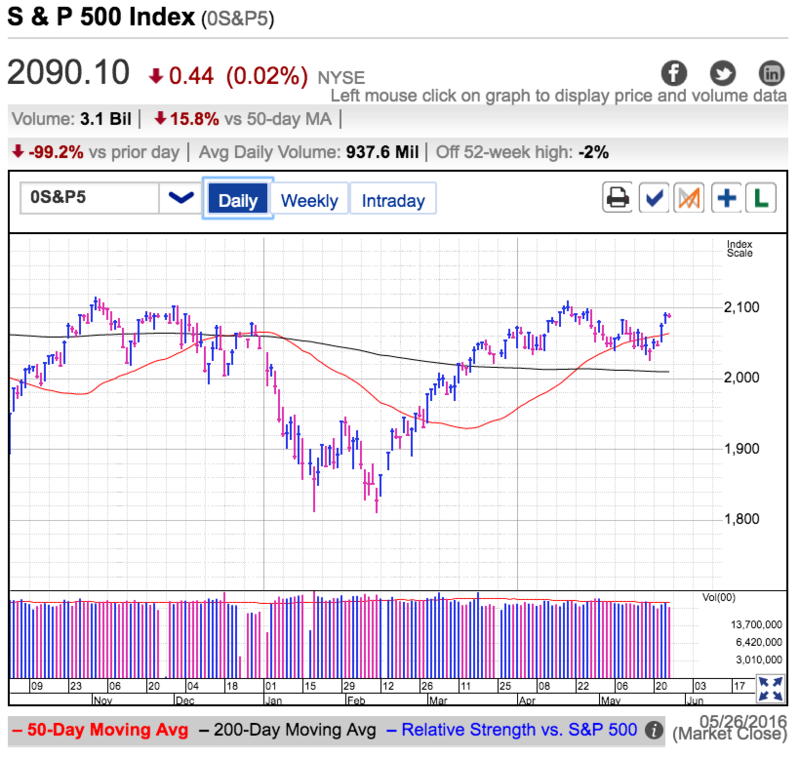 Prices move when traders change their minds and throughout Thursday, bulls stayed stubbornly bullish while bears remained stubbornly bearish. Recent weakness has been driven by flare-ups of the recurring Chinese/Asian slowing and sluggish domestic earnings themes. These persistent stories caused us to bump our head on 2,100 resistance last month and now that we’re 50-points lower, we are left wondering if this is a buyable dip, or the start of something far more insidious. The thing about recycled headlines is they rarely lead to sustainable moves. When a story has been with us for six-plus months, there is plenty of time and opportunity for it to get priced in. Those that fear these events have been given more than enough incentive to bail out of their positions during last fall’s and this winter’s pullbacks. The remaining owners either chose to stick with this market despite these concerns, or even more bold, bought the dip despite them. This turnover in ownership transitioned us from a market that feared Chinese weakness, low oil prices, and lackluster earnings growth, into a core group of owners that is indifferent to these items. No matter what the headlines proclaim, if owners refuse to sell, supply remains tight and it is easy to prop up prices. While bears want to argue with the market for countless reasons, it is a losing cause if owners are not listening. Friday’s employment report will give us insight into the market’s mood and which direction it is inclined to go. The knee jerk reaction is more vulnerable to a downside move because both “too-good” and “too-bad” will cause impulsive traders to hit the sell button. Only a “just-right” will lead to an explosive move higher without looking back. 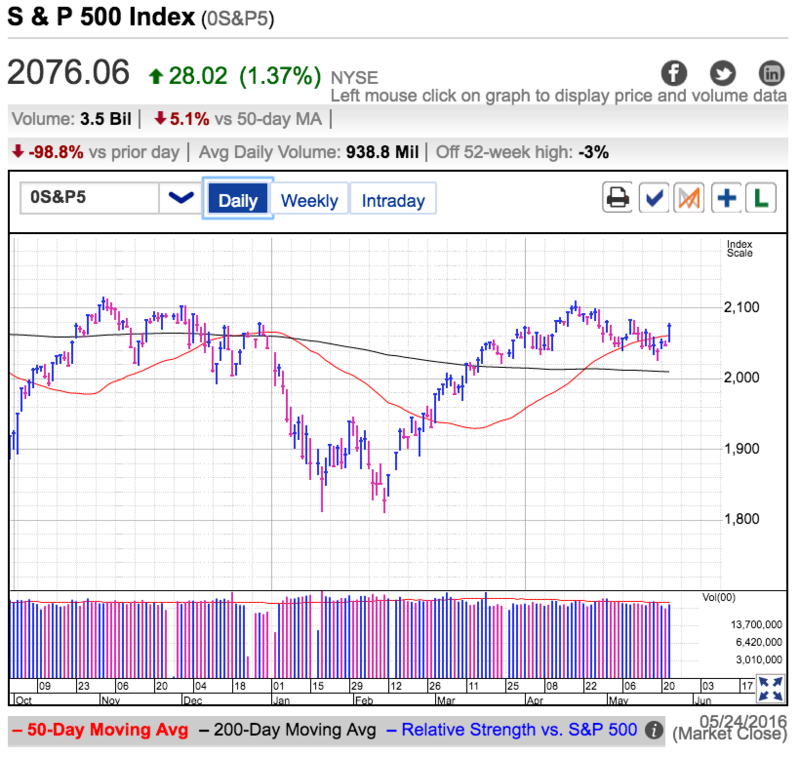 The most interesting development will be if the knee-jerk lower drops us under widely followed technical and popular stop-loss levels near 2,040 and the 50dma. If we stumble lower but then quickly recover those losses, that means we are dealing with a resolute ownership base and their reluctance to sell is keeping supply tight. Undercutting popular stop-losses and flushing out the remaining emotional owners could set up an attractive capitulation bottom and dip-buying opportunity for the adventurous. If bears cannot close the deal on Friday, stick with the bulls. On the other hand, if we stumble and cannot get back up, we’re likely headed for a retest of 2,000 support. Trade the market accordingly. The S&P 500 continues searching for stable footing following last week’s selloff. Thursday Japan took us down. Today it was China. What’s next? Only time will tell. While no one can reliably predict headlines, lucky for us we don’t need to know the headlines to successfully trade the market. While I was just as oblivious to the Bank of Japan’s (lack of) response to deflation as the rest of us, I recognized the market was overheated following the sharp rebound from February’s lows and setting up for a pullback. Even though I didn’t know what the headline would be, I knew one was coming that would push us lower. How? Easy, there are hundreds of data points every day. Some are bullish and others are bearish. While the financial media always has an elegant explanation for every market gyration, the truth is the market is doing what it wants to do and the justifications only come after the fact. When people want to sell, they will always find a reason to sell. When they want to buy, they will come up with an excuse to buy. The reasons matter far less than the actions. Now that we’ve cooled off a little, the million dollar question is if it’s been enough. While it was nice to see the S&P 500 bounce off of its late-morning lows, I’m less convinced because we didn’t undercut Thursday’s intraday lows. It was a little too easy to hold the dip, meaning we haven’t reached the point of maximum pain yet. Volume was barely average, telling us not a lot of people were reacting to these headlines and price-action. To find a real capitulation, we have to send fear through the heart of the market. The most interesting move here would be falling through 2,040 on the heaviest volume in weeks in a multi-hour selloff that undercuts most stop-losses and convinces emotional traders to jump out before things get worse. But once that wave of selling washes over the market, supply dries up and we rebound into the close. That would be our signal to buy the dip. While that is the ideal buy-setup, unfortunately the market rarely gives us exactly what we want. If we hold 2,050 for a couple more days, that is demonstrating decent support and this becomes a valid entry point. On the other hand if we crash through 2,040 and keep on going, stay away and wait for the next level of support before even contemplating a buy.